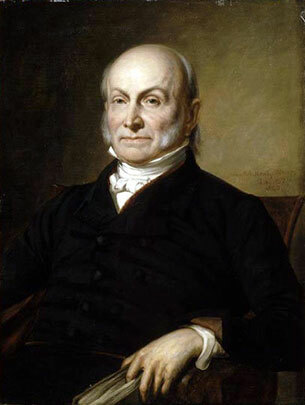 John Quincy Adams was the sixth President of the United States from March 4, 1825, to March 4, 1829. He was also an American diplomat and served in both the Senate and House of Representatives. He was a member of the Federalist, Democratic-Republican, National Republican, and later Anti-Masonic and Whig parties. Adams was the son of President John Adams and Abigail Adams. The name "Quincy" came from Abigail's maternal grandfather, Colonel John Quincy, after whom Quincy, Massachusetts, is named. As a diplomat, Adams was involved in many international negotiations, and helped formulate the Monroe Doctrine as Secretary of State. Historians agree he was one of the great diplomats in American history. As president, he proposed a program of modernization and educational advancement, but was stymied by Congress, controlled by his enemies. Adams lost his 1828 bid for re-election to Andrew Jackson. In doing so, Adams became the first President since his father to serve a single term. As president, Adams presented a vision of national greatness resting on economic growth and a strong federal government, but his presidency was not a success as he lacked political adroitness, popularity or a network of supporters, and ran afoul of politicians eager to undercut him. Adams is best known as a diplomat who shaped American's foreign policy in line with his deeply conservative and ardently nationalist commitment to America's republican values. More recently he has been portrayed as the exemplar and moral leader in an era of modernization when new technologies and networks of infrastructure and communication brought to the people messages of religious revival, social reform, and party politics, as well as moving goods, money and people ever more rapidly and efficiently. Adams was elected a U.S. Representative from Massachusetts after leaving office, the only president ever to do so, serving for the last 17 years of his life with far greater success than he had achieved in the presidency. In the House he became a leading opponent of the Slave Power and argued that if a civil war ever broke out the president could abolish slavery by using his war powers, which Abraham Lincoln partially did during the American Civil War in the 1863 Emancipation Proclamation. Deeply troubled by slavery, Adams correctly predicted the dissolution of the Union on the issue, though the series of bloody slave insurrections he foresaw never came to pass.